The 3d pen is a convenient hand-held device that allows the user to draw in 3d with heated filament that cools almost instantly to a solid structure. It uses the same filament used in 3d printers. I hope this demonstration will open new ideas in design for you in your art quilts and other creations. Once 3d designs are created they can be used in art quilts or other fiber art. To name just a few applications, consider: Discharging with bleach or using other resists; using as a stencil; using with thickened dye; screen printing and using to add a three-dimensional design. Mylar, sheet of clear glass or heat resistant film. ​YouTube – search “3d Pen Textiles” or “3d Pen Fashion”. Dover Publications for designs; adult coloring books for design ideas. Google or Yahoo Images: Search “line art” such as “trees line art”. 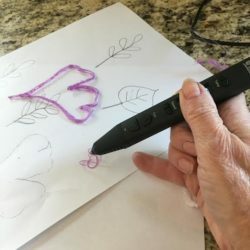 Jumpstartmag.com: Search “The 3Doodler Story” for a brief history of the 3d pen and the story of its invention. AMX3d.com for3d pen; 3d Pen Toolbox; filament assortment. The3dDoodler.com for 3dDoodler pen and filament (its filament is proprietary and not inter-changeable). Amazon.com for 3d Pen, filament and Dura-Lar. Dura-Lar, a heat resistant clear film to place on top of design to protect design; available at Amazon.com and/or Michaels.com.